Team Apl De Ap is now geared up for the next round of The Voice of the Philippines Season 2 as the Top 4 is now completed. The voting lines had been closed and te results had been tallied on February 1, 2015. When asked if they would not be singer what would they rather be, many contenders were dumbfounded while some widened their imagination. Sarah Geronimo said that she would be a dog groomer, Kokoi said he would be a stunt man and Timmy would be a Blue Ranger. Bamboo said that he might be wearing Apl’s big hats while Apl said he would be ‘preaching’ like Bamboo. The contenders of Team Apl brought out everything they’ve got to secure a place on the next stage of the competition. Mackie, the ultimate biritera sung ‘Making Love out of Nothing at All’. Apl said that her seriousness had been felt in her song. Bradley sung ‘You Gave Love a Bad Name’ and easily put everyone on the hype. Apl said that Brad’s talent is rare added with confidence and personality. Alisah sung ‘Bituin na Walang Ningning’ to share her life story. Apl shared that her talent had leveled up. 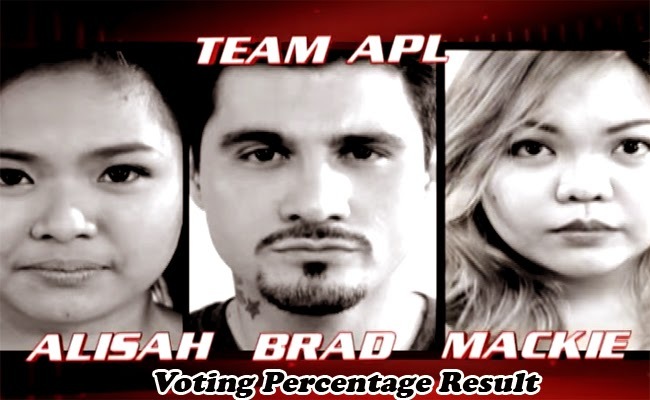 With 42,38 percent of the total votes for Team Apl, Mackie is still in the competition. Apl said that his artist should not stop hoping to be in the industry. Admitting that it was a hard decision, Apl decided to keep Alyssa. The rocker dad, Brad Holmes was let go in the competition. Suy Galvez and Daryl Ong had been joined by Alyssah and Mackie, completing the Top 4 of Team Apl and ready to go on to the next round of The Voice of the Philippines season 2.